program the system right from their home computer. 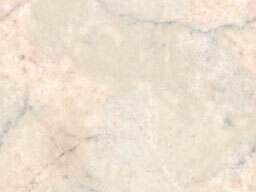 Surface, flush or wall mount - specify which. Stainless steel or gold plated housing (surface mount only). at a front door or gate, and to control access to their property. Unit can be programmed from the homeowners PC with DoorKing’s Windows compatible Auto-Programming software. Built in call waiting assures that incoming calls or guest calls are not missed. Two internal relays allow the system to control a main entry gate plus a pedestrian access gate. Calls from the access system are identified with a double ring while regular calls use the standard single long ring. 2. Four hold-open time zones. 3. Entry code time zones. Unit can be programmed to work with PBX and KSU phone systems. 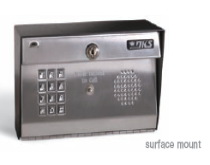 Optional slave keypad can be added for remote entry code activation of door or gate. Order part number 1812-082. 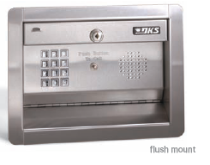 Surface mount dimensions: 6.25"H x 10"W x 5.25"D.
Flush mount dimensions: 9.25"H x 12"W x 4.5"D.
Auxiliary keypad for entry codes. phone to the wireless adapter, connect to power... and you're ready to go! Wireless Voice - Use your telephone to answer and grant/deny access to guests and visitors at a front door or gate. Wireless Data - Connect to your computer for full programming and access controls/tracking. Connect to a 2-line phone system, or to a separate cordless phone set. Full duplex - talk simultaneously. 1812 Classic and PLUS - Wireless full-duplex voice communication only. No computer programming on these models. and connects to your home computer network for programming. PC programmable 1812 Access Plus. Data connection to your home computer or laptop wirelessly. 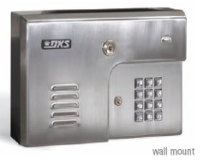 Wireless system can also be used with DKS 1830 series with full programming capabilities (no voice on these systems). An IP camera for video can be added to the wireless adapter system. Video is transmitted over the wireless network. Requires an ethernet switch at the remote location.